This section of the trail travel to the Vermilion River and along Bayou Tortue. 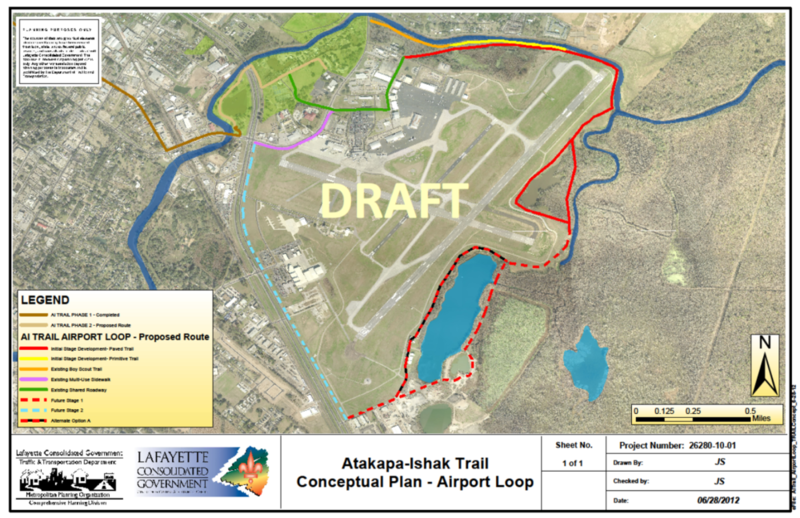 It is one of the more scenic areas in Lafayette and amazingly you can travel form downtown then be lost in the wilderness behind the airport within minutes. In comparison, this 3 mile section of the AIT offers scenery that would easily outshine places like Houston Memorial Park or rival the Mount Vernon Trail along the Potomac around Ronald Reagan National Airport. This section of the AIT would be a destination point unto itself. There are several problem areas of erosions around the airport. Construction of a trail with bulk-heading would not only impede the erosion but also make erosion a concern to a broader audience. The sense of connecting downtown Lafayette to LFT provide a essence completness to a project that over 100 more mile to construct. This segemnt of the AIT will help draw more traffic and attention to Vermilionville, the Acadian Culture Center in Lafayette (part of the Jean Lafitte National Historical Park & Preserve).